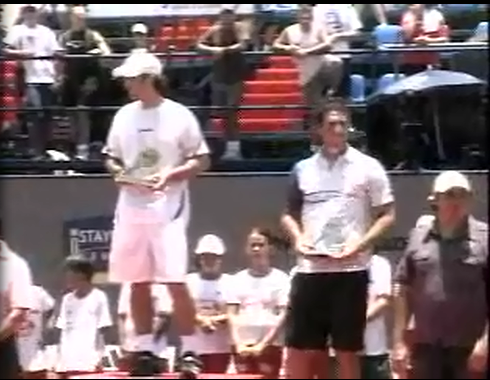 …top-seeded two-time defending champion Ricardo Mello defeated Rafael Camilo 6-2 6-1 to win the Sao Paulo Challenger title. It’s the 2nd-ranked Brazilian’s 13th Challenger championship, which makes him tied for third all time in that category. Rarely have I seen a match with such an air of inevitablity to it. “Never in doubt” is often said in a facetious fashion, but this one truly was. It seemed the big qualifier was out of gas after playing seven matches, saving match points in three, to get to this final. His groundstrokes misfired badly the entire contest, and the only thing that was keeping him afloat (barely) was his serve. Once the ball was in play, Mello won 80 percent of the rallies, I’d say. Maybe even more than that. The 30 year-old veteran brought power and consistency to the court today. The 20 year-old Camilo just brought the power – consistency was nowhere to be found. 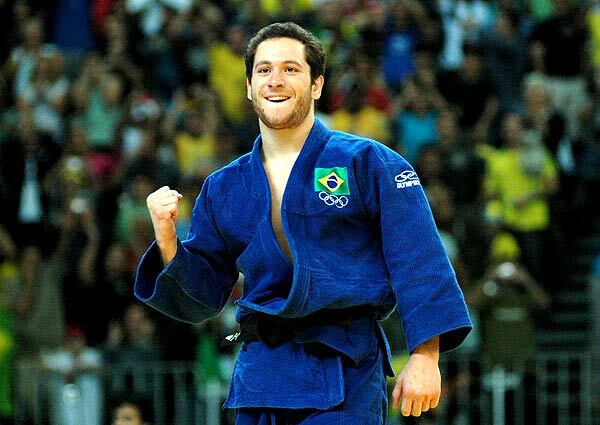 Still, a great effort this week from the lad (whose older brother is judo champion Tiago Camilo, by the way). Rafael will see his ranking jump from the upper 400’s to the lower 300’s as a result of his amazing run to the finals of this top $100,000 event. Alas, they’re still not spelling his name right. Maybe when he breaks into the Top 300, they’ll get it. Two time defending champ Ricardo Mello took about one and a half minutes to serve out his rain-delayed-and-resumed match against seventh seed Federico Delbonis. Serving at 5-4 in the final set, Mello won the first point, then Delbo hit long after winning the next point, then two service winners to 40-15, and an unreturned serve for the game set and match to Mello 6-4 5-7 6-4. 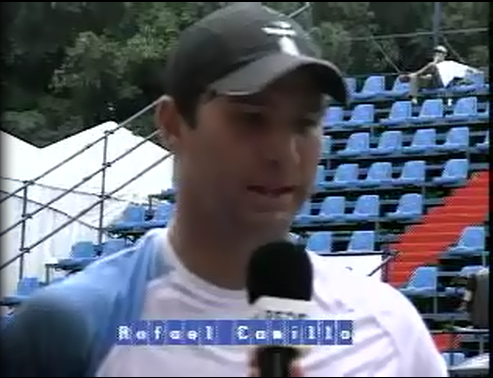 He’ll play Rafael Camilo in the final, to begin at 8am Eastern Time. Livescore link is here. Livestream is here. Right now they have a piano on the court and are singing opera. I wish I were kidding. Watch at your own risk! It’s a shame we don’t have someone like caioswim in Noumea, but here are some pretty sweet pictures of Millot’s championship victory over Muller. It was the 24-year-old Frenchman’s first Challenger Tour title (and his first final since June of 2009). Second seeds Freddie Nielsen and Dominik Meffert took the dubs trophy 7-6(4) 5-7 10-5 over top-seeded Flavio Cipolla and Simone Vagnozzi). 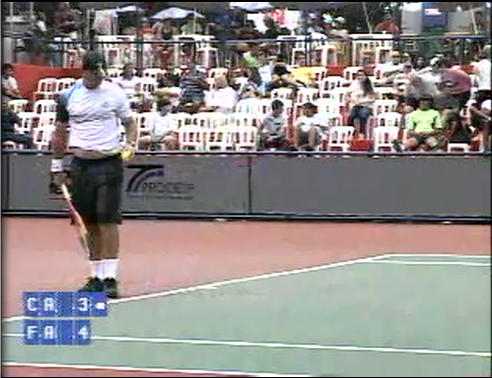 It’s Saturday at the Sao Paulo Challenger, and somehow we are mostly on schedule in this rain-plagued tournament. How about that? As such, there will be two semifinals today. As opposed to, say, four. 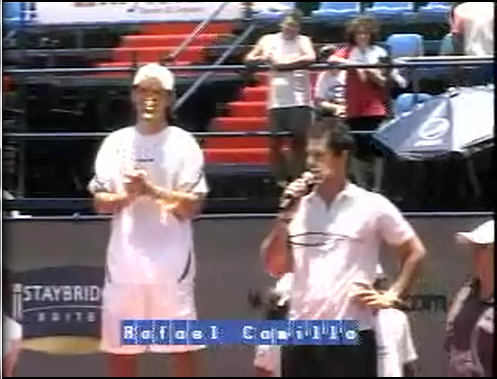 The first contest is the decidedly non-marquee matchup between 20-year-old Brazilian qualifier Rafael Camilo and heretofore (and possibly still) anonymous 25-year-old Spaniard Adrian Menendez-Maceiras. But just because this is the semi with the lesser known (if known at all) names in it doesn’t mean this is an insignificant match. Quite the contrary, in fact. As this is a $100,000 event (near the cream of the crop for the Challenger Tour), to say that this first meeting between the two unseeded semifinalists is a big opportunity would be a huge understatement. Nevermind the extra $3,460 the winner of this match can add to the $5,020 he’s already won this week (although they probably mind it very much); a finalist’s points at this event would see Camilo’s ranking jump from #448 to around #306 (his career high was #433 about a month ago), or send Menendez from #283 to around #238 (his career high was #174 in May of 2008). Suffice it to say: a lot on the line. Don’t even need Hawkeye to make that call. If you’ll recall, Camilo was the guy who withstood second seed Horacio Zeballos’ 21 aces and 2 match points in the 2nd round. I got to see him in yesterday’s 6-4 6-2 quarterfinal drubbing of Thomas Fabbiano, and I was suitably impressed. Camilo’s got game, y’all. He’s also got a good bit of a gut (and not the Roberto Busto kind) too. So gutty is he, in fact, his shirt was riding up over the top of it at various intervals during his match. Unsurprisingly, perhaps, he also possesses a very substantial weight of shot; large-and-in-charge serve, hefty forehand, and a backhand that looks shockingly like Robin Soderling’s (if not in quality than certainly in trajectory). I haven’t had a chance to see Menendez play this week (or ever), so I’ll just run with that ignorance and blissfully predict Camilo will score the upset here. After all, the guy’s already 6-0 on the year and has beaten two players even more highly ranked than Menendez-Maceiras this week. And if he wins this match, maybe they’ll even spell his name right during the post-match interview. Yesterday I saw the best match of (the week-old) 2011. Today I saw the craziest – although I missed the Falla-Nishikori lunacy in Chennai, it should be said. But even if I had seen that particular Indian insanity, this match still might out-crazy it. I’m speaking, of course, about today’s calamitous quarterfinal between third-seeded Joao Souza and seventh seed Federico Delbonis at the $100,000 Sao Paulo Challenger. Total loco-motion. We’ll pick up the action in the first set tiebreak. Souza got the mini-break on the first point but relinquished it on the sixth, and we moved forth on serve until Souza served at 4-5. The 22-year-old came to net on a good approach that Delbonis met with a better reply, a superb low backhand slice that Joao couldn’t half-volley, giving the 20-year-old Argentinian two set points. Sousa saved the first with an ace, but Delbo converted the next one on his serve with a couple of forcing forehands, the second of which Joao hit long. First set to Delbonis 76(5). Except! Two games later, he was back in the jam again. Would there be worming? At 4-5 30-all, Joao jwas 2 points away from the 2nd set. The home crowd rhythmically clapped, as home crowds tend to do. But Delbo closed out to 5-all on an unreturned approach shot and an ace. In the next game, Souza opened with a forehand full of longing, over the baseline for 0-15. The Brazilian then came to net on a down the line approach, but was passed with a beautiful forehand crosscourt from the Argie. Joao disputed the call with the ch/ump, as the crowd whistled its disapproving whistly noises. This would be a foreshadowing of things to come. I had a screenshot of this moment, but now it’s gone – have a screenshot of the Groths instead! Souza returned to the baseline, and aced with a cry of “Allez!” Huh. J-Wow, clearly keyed up, won a long rally on the next point with a deep ball that Delbo couldn’t half-volley off the baseline. 30-all. A service winner and another “Allez!” got him to game point (and got me to thinking he needed to allez off with the “Allez”s – who do you think you are, Joao, Justine Henin?). And then Federico forehanded long to cede the 11th game.